Kimura, H. (2014). Establishing group autonomy through self-access center experiences. Studies in Self-Access Learning Journal, 5(2), 82-97. In this article, I argue that a self-access center (SAC) should be able to foster group autonomy, although SACs were originally developed for individually autonomous L2 learning experiences—i.e., each student studying L2 on his or her own. Along with offering learning materials and chances for individual self-study, a SAC should provide opportunities for building and maintaining a learner community. The data obtained by a narrative frame and subsequent e-mail correspondence demonstrated that active users often come to SACs to do homework and prepare for classes. They are happy to work together and have opportunities to make friends with students in different classes and in different year groups—i.e., mutual peer support is vital. Fun activities for establishing rapport and boosting L2 learning motivation are worth implementing. Learner autonomy ultimately involves interdependence between learners in a well-functioning learner community, and for this purpose a SAC can and should be a physical space where students can comfortably spend time and interact with other students, as well as with counselors and teachers. Current interest in L2 learner autonomy reflects the common understanding that in-class learning is usually not enough for language development because learning another language requires investment of a great amount of time and effort. Thus, learners should develop the capacity to control or take charge of their learning, i.e., develop learner autonomy (e.g., Benson, 2011a). The primary focus has been placed on individual cognitive and affective development so that the student can become an independent language learner. For this purpose, tertiary educational institutions have set up self-access centers (SACs) where learners have access to a wide range of language learning resources for their independent out-of-class study (Gardner & Miller, 1999). There are shared assumptions that different individuals learn languages differently and that learners need to be self-directed to be truly successful. Thus, SACs are thought to be effective because they are adaptable to different interests and needs of individual learners and because they promote autonomous language learning. However, establishing a space for self-study with a variety of materials stored and ready for use does not automatically create autonomous language learners. In theory, autonomy implies that learners are standing alone in their journey of learning. In practice, language development is cognitive and affective, and it is mostly possible in specific sociocultural contexts. Learner autonomy researchers have recognized the significance of social contexts and reframed the concept, for example, as follows: “(A)utonomy is a social construct that implies interdependence rather than independence” (Benson, 2011b, p. 16). However, this sidestepping is more rhetorical than meaningful for the theoretical development and practical application of socially developed learner autonomy. Faced with this challenge, L2 learner autonomy research may need to move in a more dynamic direction, and for this purpose, sincere, constructive, and critical student voices are needed to explore how SAC learning helps students become independent through experiencing interdependence. Hughes, Krug, and Vye (2011, n = 299) conducted a study of learners’ socialization through SAC activities. The researchers found a significant increase in the number of users over a five-month period and reported out-of-class learner community development. For example, students started recommending language learning materials and signed out these materials at increased rates. They started to use Facebook to stay connected, in English, and organized English events on their own. The researchers concluded that their SAC helped students build social networks, through which they developed learner autonomy through exercising group autonomy. Gillies (2007) conducted another quantitative study (n = 60) on the operation of a SAC and found that regular SAC users and non-users are identified at as early as the beginning of their first year, and the number of regular SAC users decreases in the higher grades. Students who have used SAC only to fulfill their course requirements, students who are not eager to “use” the L2, and students who do not have an intrinsic motivation to learn the L2 are likely to stop using their SAC after an initial and often required period of use. 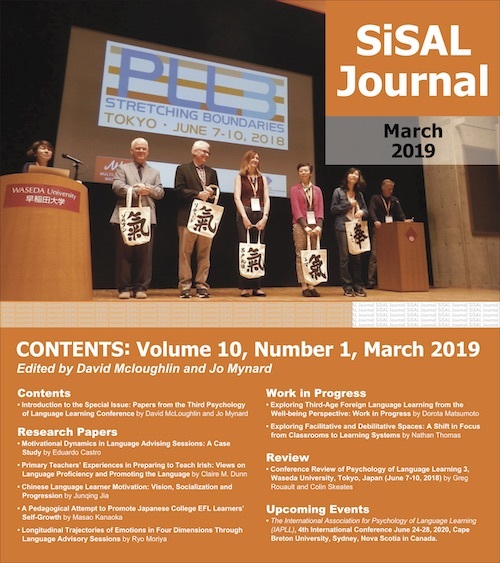 Gillies’ follow-up qualitative study (2010, n = 9) demonstrated that reluctant students seem to develop a misconception that SACs are accessible only to those students whose English skills are at a sufficiently high level. However, the sources of motivation, individual or social, that cause some students to keep using their SAC and appreciate SAC learning are still to be investigated. How do students perceive SAC learning experiences? What motivates them to keep coming to their SAC? The school, which I used to work for as a part-time teacher and SAC counselor, has a department of International English and about 60 students are accepted annually. The SAC was originally designed for the students enrolled in the department, but now it is open to other students, e.g., child education majors, as well. Full-time faculty members are involved in the SAC activities as supervisors, and two part-time SAC counselors who are fluent L2 users of English run the SAC. The counselors stay in the SAC and help students in learning English outside of classrooms. One of them also teaches regular classes part-time. The SAC has books, DVDs, and other individual learning materials, including PCs. The SAC counselors conduct some counseling about learning English and sometimes help students with their homework when necessary and appropriate. They also serve as librarians, managing these materials. Part of the space is designated for individual learning, but there are also two large, round tables that can accommodate about six students each for collaborative learning. Food and drinks are not allowed. The two English counselors organize lunch-time events called All English Lunches (AELs) individually two days a week. Sometimes, they have a featured speaker, and at other times there is a specific theme, or students have fun with games. Participants are supposed to speak English at AELs. Occasionally, special events such as a Halloween party or an All English Cooking Day are held. Students help organize these events, and they are encouraged to use English during the process. AELs and special events are the exception for the no-food policy, and students can bring their lunch and eat in the SAC. Teachers and counselors share information about students and work together to help less-skillful students with their study and inspire students with higher English proficiency and motivation to do extra work outside of classes. The learner participants were 30 female English majors who visited a SAC at a women’s university in the central part of Japan. The two current SAC counselors recruited volunteers for me and asked them to fill in the narrative frame sheet (to be discussed in the next section) in their free time. Among the volunteers, 23 students (76.7%) actually handed in their complete sheet to the counselors. I asked five of the participants, whose narratives I found both coherent and intriguing, to elaborate on parts of their stories through e-mail. In addition, I asked the two SAC counselors to share their views on the SAC through e-mail communication. All of the names used in this article are pseudonyms. I collected two sets of data for this study. First, 23 participants filled in a narrative frame (Appendix A for Japanese, filled; Appendix B for English, blank) during the spring term of 2013. One student filled out the frame all in English, four students all in Japanese, and 17 in both English and Japanese. A narrative frame can be considered to be “a story template consisting of a series of incomplete sentences and blank spaces of varying lengths” (Barkhuizen, 2011, p. 12) that are used to extract a coherent story rather than isolated answers to isolated questions. Sentence starters guide participants in constructing a story of their learning experience and help researchers to elicit the information in a structured form (Barkhuizen & Wette, 2008). Thus, narrative frames scaffold respondents with the narrative structure designed for the specific study on the one hand, and researchers obtain the specific data they want to collect on the other hand (Barkhuizen, Benson, & Chik, 2014). The data from narrative frames are usually analyzed statistically and presented in descriptive statistics. Swenson and Visgatis (2011) described this advantage of narrative frame research as follows: Narrative frames were “used to bring together different stories from different people in order to extract the commonalities in their stories” (p. 442). In this study, however, the number of learners who submitted the complete frame was only 23 and thus was too small for systematic statistical analysis to be reliable and valid. For that reason, each frame was read as one short narrative and underwent thematic analysis (Barkhuizen, Benson, & Chik, 2014). Second, I asked five of the participants in the first phase to share their stories in more detail in e-mail correspondence. I felt the need for more detailed and personalized content in their storied episodes than captured in the narrative frame because the frame only provided a limited space after each sentence starter and some of the stories need to be elaborated so that I could understand what the writer actually experienced and how they felt about it. The five participants of the second phase responded in English, Japanese, or both. Two students responded five times, two students three times, and one student once. The length of the messages varied: from 53 to 206 characters (99.4 characters on average) in the case of Japanese and from 67 to 145 words (99.2 words on average) in English. In addition, I asked the two SAC counselors the following questions via e-mail: What do you think is the most important job of SAC counselors? What are the challenges? I thought their views would help me better understand what the SAC users shared in the narrative frame and e-mail exchanges. The data also served as a layer of triangulation. The counselors responded in English. 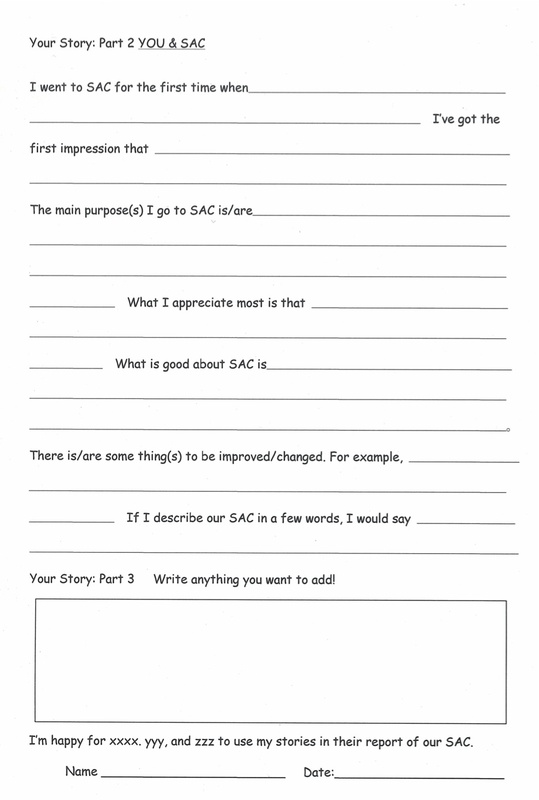 Two SAC counselors at the institution distributed the narrative frame accompanied by demographic questions and a consent form when the students came to their SAC. The narrative frame had eight sentence starters, and the participants were asked to fill in the form in their free time, although participation was voluntary. I translated the data collected by the narrative frame and demographic questions into English (when written in Japanese) and combined all into one Excel file (Barkhuizen & Wette, 2008) for identification and categorization of themes (Miles & Huberman, 1994). I also translated the e-mail correspondence written in Japanese into English, identified episodes, or small stories (Bamberg, 2006), and categorized them into different themes. A colleague of mine read the translations for verification and assisted in identifying and categorizing the themes through discussion. The colleague and I met twice for one-hour sessions. In this section, I discuss the findings from the narrative frame and elaborate the discussion with reference to some follow-up data from e-mail correspondence with students and SAC counselors. From the results of coding and categorizing, the following key themes emerged: (1) fun activities, (2) learning together, and (3) learning inside and outside of class. I argue, first of all, that occasional and weekly “fun” activities are useful for nurturing the group cohesiveness of L2 learners and for maintaining motivation for L2 learning. Second, socializing (i.e., participation in social activities) and learning are not two separate things in learning an L2, and psychological membership in the L2 learning community helps stabilize commitment to the goal of developing language proficiency (Dörnyei & Murphey, 2004). Third, a large portion of the SAC learning was directly related to class learning such as doing homework and preparing for class presentations. In the last sub-section, I briefly discuss limitations of this study and directions for further studies. Fun activities organized as SAC activities are not just for the sake of having fun. Some users make use of the chances to transfer learning outcomes to real language use when they help organize SAC events. 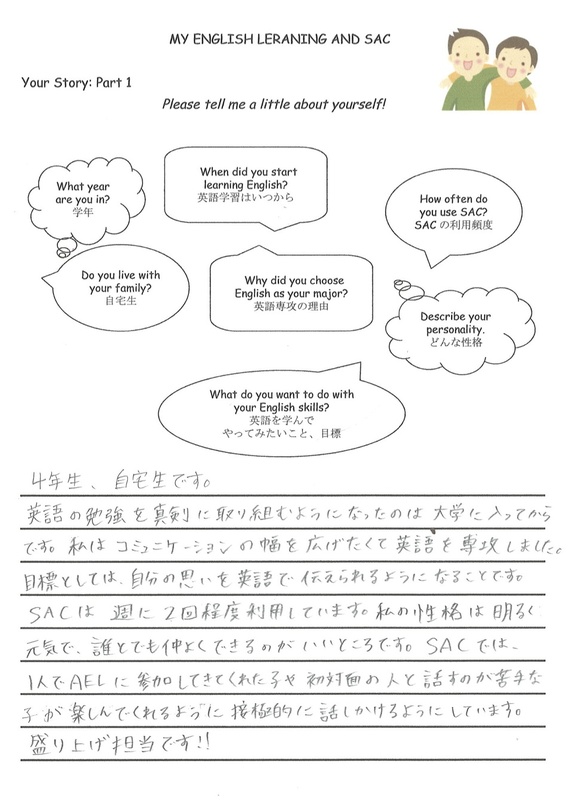 One student, Ayako helped decorate her SAC before a Halloween party and wrote in her e-mail that she was happy that she actually used English for a real purpose. During the event, she used expressions such as “Can I …?” “Is this better?” and in her e-mail she said, “The target language suddenly became a part of me,” and she referred to her feeling of language “ownership.” Students who learn their L2 in a foreign language learning environment often do not have opportunities to use the target language outside of classrooms for real purposes, and they appreciate these chances for spontaneous language use. Parties and events, if planned thoughtfully, are able to provide experiences of success so that students can gain confidence through actual use of the language. Riko (one of the counselors) talked to me at a party with a big smile on her face, “Long time no see! How have you been?” I was ashamed of myself because I had not been so serious about learning English in those days. I thought that Riko somehow knew about my recent tardiness and laziness, so I made up my mind that I would come to the SAC more often and study harder because I did not want to disappoint Riko. Maybe the most important yet challenging job of a SAC counselor is to let the students know that we are there for them. All English Lunches, parties, and posters don’t seem to be good enough for students to keep coming back. …I’ve been talking to the students outside the SAC, asking them if they need help with their schoolwork or inviting them to our parties and events. Even when I do not talk to senior students (senpai), I observe them, hear them talk, and see what they do and how they do it. Parties and AELs are good chances to get to know them in person. What they talk about with counselors interests me, too. I may experience similar things in the near future—their problems and the like. I feel I’m lucky when I make friends with juniors and seniors through SAC activities. To recap, fun activities and events provide students with chances for real language use, and they are worth the investments of time, resources, and energy in order to establish rapport among students and boosting—or re-boosting—the L2 learning motivation of individual students. The need for learning arises from engagement in personally relevant activities (Roth & Lee, 2006), but the relevant activities can also be fun. Yes, we sometimes help each other with our homework and do work together, but it’s useless if I just copy. Our teachers do not give us such easy homework. Usually, the assignments we receive are mostly preparation for the next class. If we copy, we are in trouble in class or on tests. In addition to enjoying doing homework in the presence of others, Setsuko referred to the support she could receive and the comfortable environment. When I’m in trouble, I can ask my friends, SAC counselors, or teachers for help. I feel more comfortable doing homework in the SAC. Besides, as I wrote in the narrative frame, I think the SAC is like my second home, and in that sense, I’m doing it at home, sort of. Students first rely on each other. Then, they come to us. If the instructions (how to work on the assignment) are not clear to the students or they have different ideas about the assignment or about what to do or how to do it, and if we (counselors) don’t have anything to say or to do for them, then one or two students will go to their teacher’s office. In the literature, group autonomy has a motto: peers first, then teacher (Jacobs, Power, & Loh, 2002). Students learn not to rush to teachers; they first seek support form peers. Interdependence does not mean they are not self-directive. Students are positively interdependent and fostering a group support system in their SACs (Jacobs & Kimura, 2013). Second, it is noteworthy that Setsuko used the “home” metaphor to describe their learning experience in the SAC. This is new in the literature on SACs as far as I know. Another student, Miku, wrote, “We are like one big family.” Group dynamics researchers argue that the sheer amount of time people spend together contributes to bonding among the members and produces favorable affective outcomes leading to positive cognitive outcomes (Dörnyei & Murphey, 2004). The physical proximity and the contact and interaction among students in the SAC create a safe and comfortable environment for learning. Their need to belong (Baumeister & Leary, 1995) to a learner community should not be disregarded because the reason students continue to come is likely to be, at least partly, social. In a comfortable space, the students appreciate the mutual memberships, which help them in constructing their social identities—i.e., who they are with respect to others and as active SAC users. SAC was developed based on the understanding that in-class learning is usually not enough, especially in EFL contexts, for L2 learners to become skillful users of the target language. They need to do extra work outside of class, beyond the course requirements. Learners do not receive much meaningful input and lack opportunities for meaningful output, and in-class learning tends to be form-focused learning or studying and does not allow time for fluency development. The rationale for SACs sounds, therefore, very reasonable. Setsuko: Besides doing homework and preparing for class, I sometimes write and send e-mails to my former host family back in the United States. I can ask SAC counselors for help when necessary. I want to make my messages clear and good. I don’t want my host family to misunderstand me. Is this what you call extra? Kanae: I don’t have time to do extra. My classes keep me busy. I sometimes watch DVDs, but it’s mostly for fun. I’m not thinking that I’m studying when I watch DVDs. Shiho: For extra, to be honest, I started a couple of things such as reading English newspapers and magazines, but it’s always difficult to continue. Classwork has priority, my part-time job keeps me busy, and I sometimes hang out with my friends after class or over the weekend and do not spend any time on studying. It’s difficult to finish all the requirements like (reading) graded readers and (keeping) a diary. This finding coincides with the study results of L2 learners’ time use outside of the classroom: 61% of the time spent on L2 learning was relevant to schoolwork (Visgatis, 2011). Students seem to be under immediate pressure to complete classroom requirements. Thus, the distinction between in-class learning and out-of-class learning, which is often referred to in the literature on self-access learning, would have to be reconsidered. Homework is what students are supposed to do outside of class, but it is given to enhance or supplement in-class learning. It is not beyond but within course requirements or embedded in taught courses. There are two major limitations of this study. First, all the participants were female students in the same university, and the results should be understood with caution. Second, the study was cross-sectional and did not investigate the changes or development of learners’ attitudes and motivation, although some participants referred to some changes of their mindset. Longitudinal case studies to explore, for example, what triggered positive changes are needed. This exploratory study indicates that L2 learners appreciate the learning space for learning together in a SAC, although SACs were originally established for independent self-study. Researchers and teachers have been promoting integration of self-access learning into regular curriculums (e.g., Croker & Ashurova, 2012) and underscoring the social role that SACs can play (e.g., Hughes, et al., 2011), but the past research has still fallen short of emphasizing the significant role the specific physical space can actually play for the purpose of fostering learner community building and assisting in maintaining L2 learning motivation. Attractive and engaging language learning events can be performed in a SAC, and good learner communities can be formed there. The “we” identity cannot be cultivated in a vacuum. In a well-functioning SAC, learner autonomy ultimately involves interdependence between the learner and the teacher/counselor and between learners. Harumi Kimura teaches at Miyagi Gakuin Women’s University, Sendai, Japan. She earned her doctorate from Temple University. She studied L2 listening anxiety in her doctoral study. She recently coauthored a book with Dr. G. M. Jacobs, Cooperative Learning and Teaching, in English Language Teacher Development Series (2013, Alexandria, VA: TESOL). Benson, P. (2011a). Teaching and researching autonomy (2 ed.). Harlow, UK: Longman. Dörnyei, Z., & Murphey, T. (2004). Group dynamics in the language classroom. Cambridge, UK: Cambridge University Press. Gillies, H. (2007). SAL for everyone? Motivation and demotivation in self-access Learning. Studies in Linguistics and Language Teaching, 18. 117-137. Jacobs, G. M., & Kimura, H. (2013). Cooperative learning and teaching. Alexandria, VA: TESOL. Jacobs, G. M., Power, M. A., & Loh, W. I. (2002). The teacher’s sourcebook for cooperative learning: Practical techniques, basic principles, and frequently asked questions. Thousand Oaks, CA: Corwin Press.